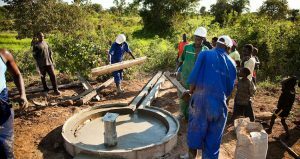 Overcoming the Water Crisis: How one village comes together to drill a well in their community of Orunyamo, Uganda. There’s a water crisis in Uganda and it’s affecting a northern Ugandan village called Orunyamo. 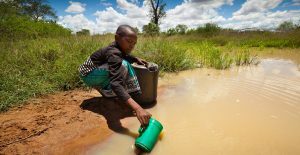 For many years the residents have been using a dirty water source for drinking, cooking, and washing. It’s a muddy puddle created from rain runoff and shared with local herds of cattle and goats. Not surprisingly, they get sick often. Safe water exists a few hundred feet beneath Orunyamo, but accessing it requires drilling a well using a mud-rotary drill. Mud-rotary drilling requires water to lubricate and carry the cuttings to the surface. What water does Orunyamo need to use to drill a new well? The people of Orunyamo have spent months learning about hygiene and building latrines for their homes. They are ready to access safe water, and they’re ready to work. They begin by bringing large boulders to the drill site to set the drill rig in place. They dig trenches for drilling run-off. They start to go back and forth between the old water source and the site where there new well is being drilled. They do this all day, a few gallons at a time. Those who are too old or young to carry water sit expectantly during the long, hot hours of drilling. As they watch, the dirty water is helping them reach the safe water that will soon flow from their well. The people of Orunyamo are using what has hurt them to access what will keep them healthy. They are bringing what is killing them, and it is being turned into something that will give them life. Some sights and sounds from Orunyamo during the drilling process. Women gather dirty water from the old source to bring to the well drilling site. Drillers check the trenches for cuttings that tell them when they’ve hit the right depth. People gather to watch. A child falls asleep. A grandmother dances with her first jerry can of safe water. A community gathers to celebrate.